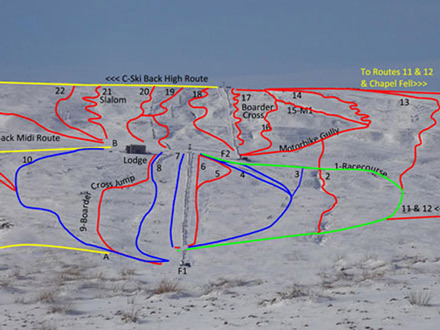 The Weardale Ski Club (500m-650m) is based at the Swinhope Ski Area, 50km west of Durham in the North Pennines. The ski area boasts some of the longest pistes in England, a few of them stretching up to almost a kilometre when the snow cooperates. The ski club is a not-for-profit organisation run entirely by a passionate group of local volunteers, and as such, access to the slopes at weekends and bank holidays is members-only. Check road conditions and opening hours before going; the mountain only opens on days that have both enough snow and enough manpower. Two permanent rope tows, each about 400m long, bring skiers to a handful of marked pistes. The terrain at Weardale caters to a higher level of skiers and snowboarders than most other ski areas in England, with natural snowparks and plenty of off-piste skiing available. The terrain is relatively challenging and the ski area is one of the best in England. However, while beginners can amuse themselves on the F1 lift, first-timers are perhaps better off learning the ropes at the nearby Silksworth dry slopes, which also offers lessons and ski and snowboard equipment for hire.